To make the mince filling: Place the raisins, golden raisins, currants, chopped apple, mixed candied peel, grated orange and lemon rind, sugar, spice, and salt in the work bowl of a food processor. Process until finely minced, but not pureed. Add the almonds and process briefly, just to break up the almonds. Transfer the mixture to a bowl. Stir in the handful of golden raisins and handful of currants, then the melted butter. Mix in brandy to taste. Store airtight in the refrigerator, 5 days or until ready to use; mince will keep at least a month in the refrigerator, tightly covered. Combine the flour and salt in a bowl. Add the butter, mixing it in thoroughly; the mixture should look like breadcrumbs. Drizzle in the water, until you can squeeze the dough together and it’s cohesive. If it doesn’t hold together nicely, add a bit more water. Divide the dough in half, and shape each piece into a flattened ball. Wrap in plastic, and refrigerate for 30 minutes, or overnight. When you’re ready to prepare the tarts, if it’s been chilling for longer than 30 minutes, let it warm for 15 minutes or so. Preheat your oven to 200°C. Roll each piece of dough into a 25cm circle, about 4mm thick. Cut rounds of dough to fit your muffin pan. Measure the bottom diameter of one of the cups; that’s your starting point. For a standard muffin pan, add 4cm. For a mini muffin pan, add 2,5cm. Nestle the dough circles gently into the muffin cups. Don’t stretch them. Where the dough folds, snip through the fold, and lap one side over the other, pressing to seal. Cut stars from the dough scraps. Prick the bottom of each several times with a fork. 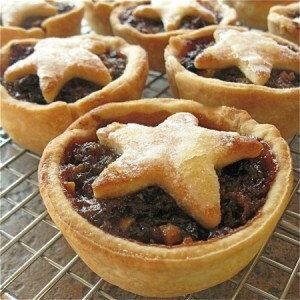 Spoon about 2 tsp fruit mince atop each of the mini tart crusts (about 4 generous teaspoons for the larger tarts). Spritz the stars with water, and center one star atop each tart. Sprinkle with castor sugar, if desired. Bake the mini tarts for about 20 to 22 minutes, until they’re golden brown (28 to 30 minutes for larger tarts). Serve warm, with brandy butter or heavy cream. 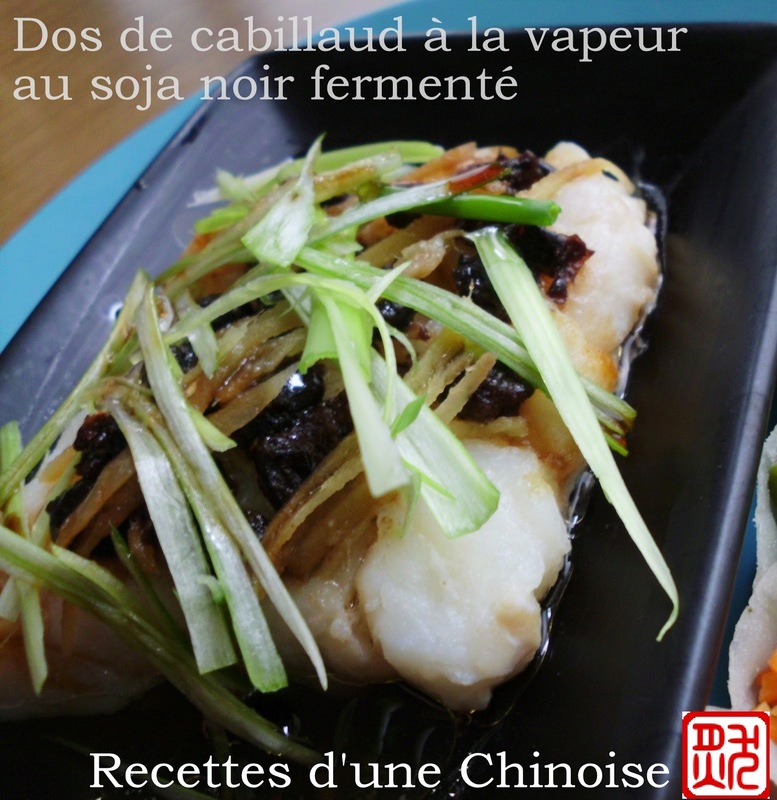 Douchi is a Chinese condiment that goes well with fish and seafood. Julienne the ginger and chives. Spread a thin layer of Shaoxing wine onto the fish, then salt it. Allow to rest 10 minutes. Bring the steamer’s water to a boil. Spread the douchi, then the ginger onto the fish. Place fish into a hollow dish. Steam cook over high heat 7 minutes. Remove fish from steamer, pour out excess liquids. Sprinkle the julienned chives onto the fish. Heat the oil 1 minute at 900W in a microwave. Pour the hot oil onto the fish, then the soy sauce. Prepare the meat the day before. Slice the leek and dice the carrot, onion and celery stalks. Place all in a pot with the meat and bay leaf. Cover with cold water, bring to a boil, allow to simmer very gently for an hour. Add a pinch coarse salt and a little pepper, simmer another 2 hours at least. Skim the fat from the surface. Add a little extra water if necessary. Add the sage, cook another hour. The meat must be tender and almost falling apart. Removethe meat from the pot, allow to cool to room temperature. Remove superficial fat, then wrap tightly in plastic. Refrigerate (1 to 2 days). Prepare the eggplant caviar. Preheat the oven to 180°C. Cut eggplants in half lengthwise, criss-cross the open surface with a knife’s tip. Rub with garlic, add a little sage, salt, and drizzle with olive oil. Bake half an hour, or until the eggplants’ flesh softens and detaches easily from skin. Blend coarsely with lemon juice, a little olive oil, herbs (10 leaves parsley and 4 mint leaves) and anchovy. Salt and pepper. Increase oven’s temperature to 200°C. Slice the cold meat to 5cm thick pieces. 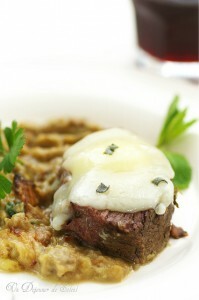 Place a slice of cheese on the meat, along with a little chopped sage, and grill a few minutes. Serve hot. 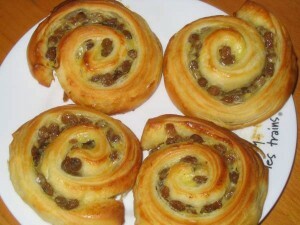 The day before, macerate the raisins in the rum and prepare the dough. Pour the flour in a large bowl, add the salt and sugar. Dilute the yeast in 1 tbs lukewarm water (max 45°C). Add the beaten eggs and diluted yeast to the flour and mix. Simultaneously, add the water, keep mixing. The dough will be slightly sticky and not very smooth. Start kneading with the stretch-and-fold method (stretch out the dough, fold it over itself, rotate it 1/4 turn, repeat). After 15 minutes of intensive kneading, the dough should be smooth and elastic. Add the butter. Knead again, until the butter is completely mixed in. Place the dough in a clean bowl, cover with a towel, allow to rise at room temperature. After a few hours (depending on room’s temperature) the dough will have doubled in volume. Punch it down until it returns to original volume. Cover with plastic film, refrigerate at least 3 hours. Dough is best prepared 12 hours ahead (the evening before use in the morning). The day of the baking, prepare the custard. Pour the milk into a pot. Scrape the inside of the vanilla bean with a knife, add the black seeds and the emptied bean to the milk. Bring to a boil over low heat to infuse the vanilla. Add the egg yolks to a large bowl. Add the sugar, beat vigorously until the mixture whitens and the sugar cristals have dissolved. Slowly add the Maizena or flour to the eggs and sugar mixture. Beat delicately so as to not form any lumps. Once the mixture is smooth, pour half the hot vanilla-flavored milk onto the eggs. Mix delicately at first, then more energetically so as to relax the custard. Once the custard is nice and smooth, pour back into the pot with the remaining milk. Place the pot back onto low heat. Stir constantly until the first boiling bubbles appear. Once the custard has sufficiently cooked, remove from heat and keep stirring to cool it faster. Roll the brioche dough out to a rectangle 8mm thick. Spread the cold custard over the whole surface. Garnish with drained raisins, do not add the rum. Roll the dough onto itself to form a long sausage. Cut into slices 3mm thick and arrange flat on a baking sheet. Use a spatula to flatten the rolls slightly into a regular round shape. Allow snails to rise in a warm, slightly humid environment (max 50°C) until doubled in volume. Preheat the oven to 200°C. Brush the snails with a little beaten egg. Bake about 20 minutes. Beware: too hot an oven will burn any raisins sticking out from the snails. For a glazed look, brush a little light syrup (water+sugar) over the snails at the end of the baking, then bake an extra 2 minutes. Have the butcher remove any nerves, vessels, and other hard parts from the tenderloin. If no tenderloin is available, choose sirloin. Place the meat half an hour in the freezer to firm it up before slicing into it (not mandatory). With a very sharp knife, slice the meat thinly (0,5 cm thick) and place into a large dish. Peel and mince the garlic. Chop the chives. Add the sesame oil and seeds to the dish along with pepper (give 6 turns to the grinder), soy sauce, rice vinegar, sugar, garlic and chives. Mix everything well together with your hands. Refrigerate the dish 30 minutes. Using a large spoon, arrange the marinated meat into glasses and serve very fresh as tapas with chopsticks, or with salad as a classic entree. Used 2 less TBS each of soy sauce and vinegar, and still seemed too salty. Used chopped meat instead of slices, so may have absorbed more liquid. Interesting base, try again! Dump the baby carrots and chopped onions into the bottom of the slow cooker, layer the cabbage wedges on top. Add the smashed garlic cloves and bay leaves, season the beef shanks generously with salt and pepper then place on cabbage. Pour in the diced tomatoes and broth, put on the lid, set slow cooker on low and let it do its thing for 9 hours. The meat will have pulled away from the bone and the marrow will be perfectly cooked. 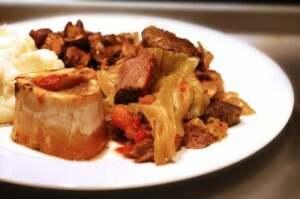 Plated the bones (and delicious marrow), shred the meat, and taste the stew for seasoning. Add a couple of tablespoons of coconut aminos if desired and some more salt and pepper. Serve with: oven-roasted mushrooms tossed with Tabil seasoning and macadamia nut oil (200°C on convection roast for 25 minutes), mashed garlic cauliflower. Tasty! A great dish on a cold day. 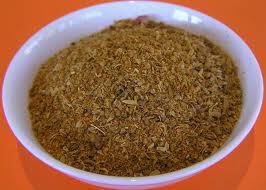 Pulverize coriander and caraway to a powder. 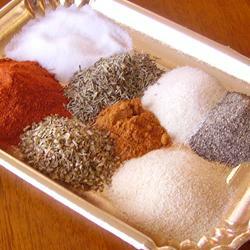 Combine with remaining spices. Store in an airtight container in a cool dry place for up to 2 months. Stir together salt, garlic powder, paprika, black pepper, onion powder, cayenne pepper, oregano, thyme, and red pepper flakes until evenly blended. Store in an airtight container.